On the eve of the 30th anniversary of the space shuttle Challenger disaster, people are looking back at that fateful day that claimed the life of Concord, New Hampshire, high school teacher Christa McAuliffe and six other crew members. The Challenger broke apart on live television 73 seconds after liftoff on Jan. 28, 1986, becoming a generational touchstone. Inside the Blossom Hill Cemetery in Concord, there's a headstone with a bright red apple on top honoring the woman who was supposed to be the first teacher in space. A number of members of the class of '86 in Concord have gone on to become teachers and guidance counselors themselves in the 30 years since. The city has been low-key on marking Challenger anniversaries as McAuliffe's family stayed in Concord and her young children, Scott and Caroline, grew up. Today, both are educators with children of their own. Caroline declined to be interviewed, and Scott did not respond to an email. McAuliffe, 37, was interviewed by retired necn reporter Greg Wayland in 1986 just before the Jan. 28 launch of the Space Shuttle Challenger. "You don't look frightened at all," Wayland said. "Oh no, I am really looking forward to it," McAuliffe replied with a smile. Also in Cape Canaveral that day was former Associated Press reporter David Tirrell-Wysocki, now the executive director at the Nackey S. Loeb School of Communications in Concord. In his office Wednesday, Tirrell-Wysocki played the audio he captured from the bleachers during the launch. He was one of the only reporters in the VIP section with McAuliffe's parents and her son's third grade class. He narrated the scene from the launch. 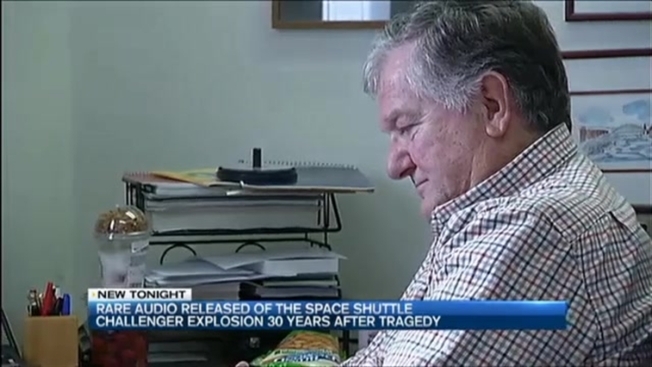 "You can hear the roar of the shuttle," He spoke into his microphone. "Ed and Grace Corrigan from Framingham, Massachusetts, standing in the bleachers with their arms around each other." Just over a minute later, you hear the spectators cheer, thinking the explosion was a planned occurrence. Shortly after, you can hear a young voice ask, "Where is it?" About minute after that, the audio is almost silent, until Tirrell-Wysocki speaks. "A hush has fallen over the bleachers; they say there's been a major malfunction," he said. "Everyone in the stands are holding their faces and crying, some of the parents are hugging their kids." When official word makes it to the bleachers, the sounds are chilling. "Oh God, no," a woman screams. Tirrell-Wysocki has not done a television interview in more than two decades, and he didn't do one Wednesday. He said the story isn't about him — it's about the people who were around him that day. The man who brought the apple to McAuliffe's headstone Wednesday was New Hampshire Rep. Mel Myler. He said he worked with McAuliffe and was at the launch with his 10-year-old son back in 1986. He's been bringing an apple to her gravesite every year for the last three decades.